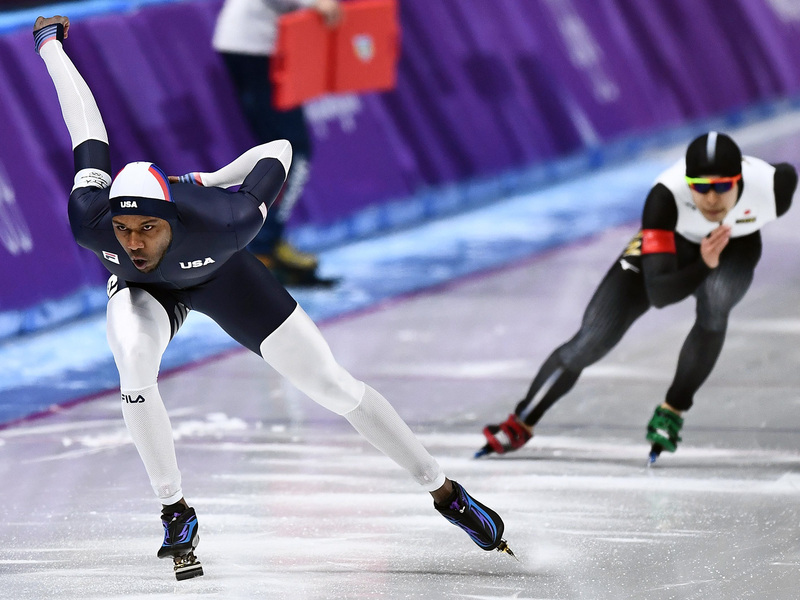 Shani Davis is inarguably a U.S. Olympic legend, but in the end, he didn't trust anyone to recognize that after what was likely the final race of his decorated career. GANGNEUNG, South Korea – It ended with a duck and a dodge, which was sad. Shani Davis deserved better than that. He finished seventh in what was probably the final race of his Olympic career, and then he ducked out of the rink without walking though the mixed zone so that he could dodge the media. As athlete crimes go, this was a parking ticket. Not a big deal. But by doing it, Davis robbed himself. Maybe he doesn’t care about a grand sendoff. More likely, he didn’t trust us to give him one, and that is what is sad: After four Olympics and one of the great American careers in the history of the Games, Davis still feels unappreciated. It’s a good thing speed-skating ovals don’t have corners. Davis would see an enemy around every one. So let’s say what we mean, whether he believes it or not: Shani Davis is an American Olympic legend. He was the first black athlete to win individual gold in the Winter Olympics. He has won two gold medals and two silvers, and he competed in four Olympics. His seventh-place finish here is actually another testament to his greatness. There were 26 skaters in this event. Davis, 35, was the oldest. The three medalists are 28, 25 and 23. And still he finished seventh. We should be celebrating this last lap, figuratively and literally, but that’s not how Davis operates. These Olympics started with Davis complaining he was not the U.S. flag-bearer, then refusing to attend the Opening Ceremony. (He said he was only going if he got to carry the flag.) His Olympics ended with a mixed-zone supervisor asking U.S. Speedskating communications director Matt Whewell why Davis didn’t walk through the mixed zone as the IOC requires. Whewell explained: Davis chose to go another way. He was asked to come back out and he declined. Reporters asked to speak to the coach who works with Davis, Tom Cushman, but Davis asked Cushman to decline, so he did. This mistrust has always been part of the Shani Davis package. At various times, he has cast a wary eye at his own teammates, NBC, U.S. officials and whichever media entity just offended him. He often trained alone, away from other U.S. skaters. He once asked U.S. Speedskating to keep his biography off its website, and when he was in his prime, he declined to participate in the Team Pursuit. There have always been people who say very nice things about Davis. These days, one of them is Maame Biney, the irresistible 18 year-old from Virginia who may be the next U.S. speedskating star. But what Davis doesn’t realize is that right now, in this moment, almost everybody would say nice things about him. That’s how it usually is at the end. Old feuds are forgotten. Slights seem smaller in the rearview mirror. People around the sport who thought Davis was petulant would talk instead about what an incredible skater he was. So let’s talk about that. There are five individual men’s events being contested at these Olympics. New world records have been set in four of them since Nov. 2015. The fifth is the 1,000 meters. Shani Davis set that record, 1:06.42, in March 2009. His record is almost nine years old, which is an eternity in a sport like this. Davis is a big enough star in a niche sport to have 23,000 Twitter followers. He is sensitive enough that, during these Olympics, he protected his tweets. Davis grew up in inner-city Chicago and became a big star, and he carried his trust issues with him into adulthood. His story is common to sports, but not common to winter Olympic sports. Four years ago, in Sochi, he seemed to have found some comfort with the public—he said all the right, selfless things, even when those Olympics did not go as he planned. Now here we are, with Davis complaining and hiding. He is worthy of our admiration, but he makes it hard sometimes. I don’t think anybody really expected Davis to medal at these Games. I don’t know if Davis even expected it. But he skated well enough in the 14th of 18 pairings here that when he finished, he was in third place. The very best skaters had not skated yet. He had to know his place would probably not hold. Still, for at least that moment, Davis was in position to medal. One of the skaters in the next pairing, Kim Tae-Yun, knocked him off the podium. The fans here roared. I hope Davis understood that they cheered because Kim is Korean, and not because they don’t like Shani Davis.